Ricky Ponting will play for Tasmania in the Ryobi Cup final on Saturday after being told his one-day international career was over. Ponting will join the Tigers in Adelaide on Friday morning ahead of the decider against South Australia, which gives him a chance to win silverware with his state side for the first time after debuting for them nearly 20 years ago. Ponting's desire to play on in Test cricket means that he needs to take every opportunity he can to keep match fit and in form by playing for Tasmania. That begins on Saturday, in what will be his first domestic one-day match since December 2007, and his seventh in the past decade. The Tasmania coach Tim Coyle said the Tigers would be thrilled to have him in the side. "He's very keen to play," Coyle told ESPNcricinfo. "He rang me this afternoon to have a chat about the make-up of our team. The team has obviously been going pretty well. We had a conversation around him being available to play. One thing he's not done in his career is he hasn't played in a winning Tasmanian title team. That's really high on his agenda. He's very excited by the fact that he's going to get this chance." 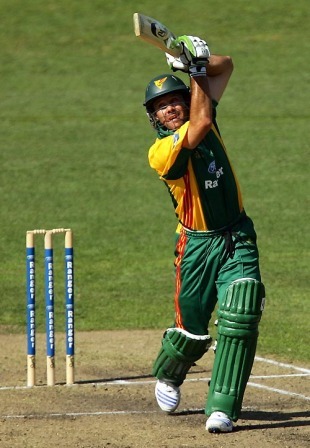 The only domestic final Ponting has played in was the 1993-94 Sheffield Shield decider, the first time Tasmania had reached the first-class final. But it wasn't a memorable occasion for Ponting: he scored 1 and 28 and was part of a side that lost to New South Wales by an innings and 61 runs at the SCG. Despite having played in the past two one-day finals, Tasmania will enter this game as the underdogs, playing away from home against the Redbacks. And although the Tigers have won six of their eight one-day matches this summer, Coyle said Ponting's return would be easy to accommodate, with Ed Cowan and George Bailey the only Tasmanians to have scored 200 runs in the Ryobi Cup campaign. "We've actually got a spot in our team that's been thrown around," Coyle said. "A few people have been tried. It is a batting spot that we've experimented with. We haven't had someone really put their hand up and grab that spot. There is a spot in our top six, no doubt about that. It's one area of our cricket that has been a little bit inconsistent at times. To have one of the greatest players of all time, that's a great result for our team." Ponting's appearances for Tasmania have been few and far between since he established himself in Australia's Test and one-day sides, but when he has returned, Coyle has been impressed with his dedication to the state cause. Although Ponting lives in Sydney, he has refused to switch state allegiances and spends time with the younger members of the squad, passing on what he has learnt in a 17-year international career. "His commitment to the team stuff is really important," Coyle said. "He commits a lot of time to others in the team. He's also very professional in his own preparation. It's great to sit back and watch him prepare for games. His experience will be a fantastic bonus for us. I'm sure he's very keen to do well. He'll come into this game with nothing hanging over his head, which has probably been an issue for him in the last couple of weeks with the one-day series that he's been involved in." Tasmania will also benefit from Ponting's presence in their final two Sheffield Shield matches as they aim to move up from third position on the table and earn a place in the decider. Ponting will be available for Tasmania's last two matches, against South Australia in Adelaide and at home to Western Australia, and then for the final should they make it. "His red-ball cricket has been tremendous this summer so it's a huge inclusion for us to have a player of his calibre coming back into our team," Coyle said. "We're very fortunate. We've gone a lot of years not having him around so this is maybe a little bit of time that was due for Ricky to give some time to Tasmanian cricket. He's had that desire - he's often said that he would love to play more cricket for us. He's going to get an opportunity to do that over the next couple of weeks."